A modern, multi-megabit, IP-based, digital network for amateur radio use! HamWAN is a non-profit organization (501c3) developing best practices for high speed amateur radio data networks. 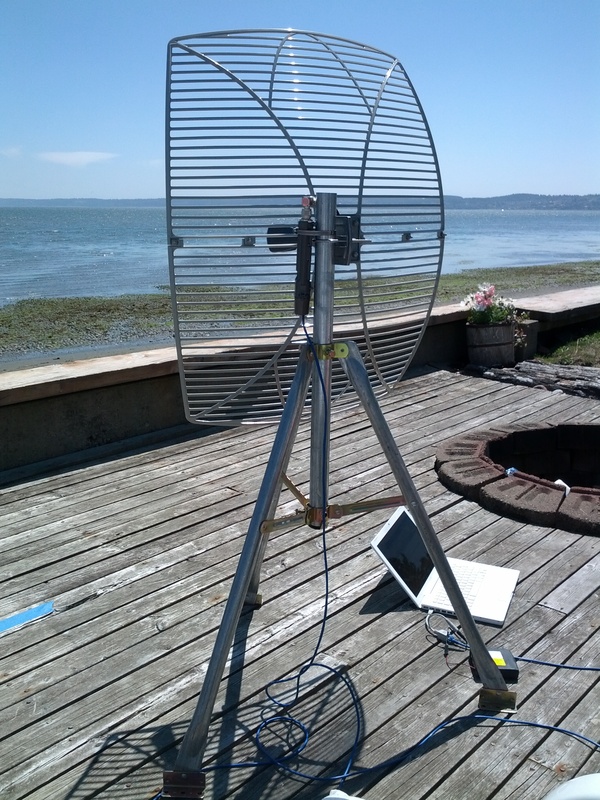 HamWAN also runs the Puget Sound Data Ring, which is a real-world network implementation of the proposed designs. So far, HamWAN networks have been used for things like low-latency repeater linking, real-time video feeds from distant locations, serving APRS I-gates, providing redundant internet access to emergency operations centers, and more. Any licensed radio amateur in the service area can connect their shack directly to the network with just a small investment in equipment and no recurring cost. Since many traditional uses for Internet at home are not compatible with Part 97 rules, this won't replace your home Internet connection. However, it works and acts just like one. 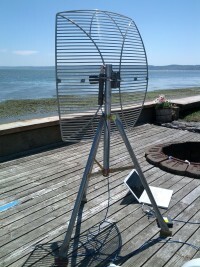 The HamWAN Puget Sound Data Ring has cells deployed at numerous wide-coverage sites. These sites are interconnected with 5 GHz modems and routed with OSPF, forming a redundant high-speed backbone to route traffic between sites and to the internet. Examine the map below to determine if you're within the HamWAN coverage area! Red "coverage areas" indicate a signal level of -70 dBm or better when using the 30 dBi recommended client antenna at 30 ft above ground. A signal level of -70 dBm or stronger will support full speed, about 10 Mbps in areas with clear line of sight and no interference. Non-red areas with line of sight may have weak signal and decreased speeds. Click on any of the nodes on the map for detail about that node. The symbol designates a site with sectors that you can connect to. 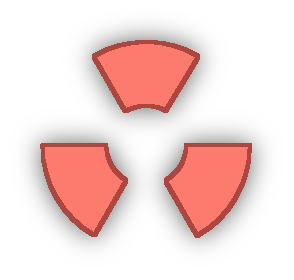 Sites with fewer than three sectors will have a partial version of this icon corresponding to which sectors are installed. are users of the network (not distribution points). The icons designate our internet peering points. Blue lines indicate live connections to the HamWAN network. Line width indicates bandwidth. While link state is live and automatic, new nodes will not show up on the map until manually added. HamWAN is not just in Western Washington! There are a handful of networks around the United States and Canada implementing the HamWAN standard. Learn more about them at Certification. For more information on what to buy, see the Client Hardware comparison page. See Client Node Configuration for instructions on configuring your modem. Join the IRC channel or mailing list for help. The coverage map is a rough estimate based on a computer model. In some areas coverage is worse than predicated, and in other it is better than predicated. You might still have coverage! Jump in the IRC channel or mailing list and ask about coverage in your area. We may be able to make it work. Due to their excellent line of sight, mountain-top radio sites in western Washington have a very high chance of getting HamWAN coverage. If you would like to connect your repeater to HamWAN for linking, IRLP, Echolink, or an APRS igate, ask in the IRC channel or email list and we may be able to help you. If you think your site would make a good HamWAN cell site, let us know! If it's a good location, we'll fund the deployment with HamWAN donations at no expense to you. If you would like to volunteer for any of the work required (see the wiki table of contents for areas that need attention), please send an email to the mailing list to let us know. We'll set you up with the right access to make changes to the website and keep track of progress. We would like to thank the following organizations for their generous support of the HamWAN project and the local HamWAN standard network.